New Delhi, Oct 17, 2014: Two desperate young lovers, a conservative foe and a missing aunt! 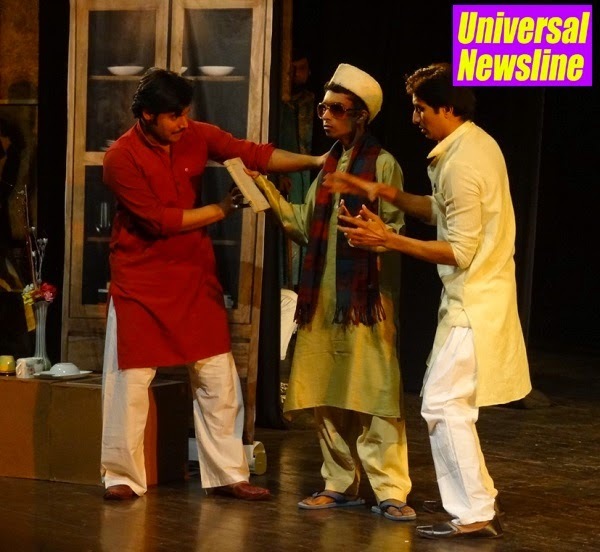 The penultimate day of the Urdu Drama Festival saw the staging of a comic play ‘Khalid ki Khala’, an Urdu adaptation by Begum Qudsia Zaidi from the English play ‘Charlie’s Aunt’. Directed by Chander Shekhar Sharma, and performed by the MASK PLAYERS ART GROUP (MPAG), the play revolves around two friends who are desperate to invite to lunch their young girlfriends whose conservative caretaker insists on the presence of a woman at the gathering. The play follows the two young men’s humor-laden attempts to arrange for the lunch that involve roping in another friend to play the part of ‘Khalid ki Khala’. The six-day festival being presented by Delhi Government’s Department of Art, Culture & Languages in association with the Urdu Academy is paying tribute to legendary writer and filmmaker Khwaja Ahmed Abbas and Qudsia Zaidi, the pioneer of Hindustani theater. The festival will end on Saturday with Qudsia’s play ‘Dhoban ko Kapre Diye’, directed by Danish Iqbal and presented by the Social Pride Welfare Society. “Qudsia Zaidi is one of the most respected names in Hindustani theatre. As a writer Zaidi was a pioneer in the field of Indian theatre and as part of the early crop of theater writers in India, she was also an inspiration to many people. As we celebrate her centenary year, it is important to throw light on some of her classic works,” says Anis Azmi, Secretary, Urdu Academy.